Thank goodness for Japanese anemones. Without them, our poor tired garden would be nearly bloom-less. Instead, our garden bursts with light pink, delicate flowers just in time to cheer summer's end and celebrate fall's arrival. Hardy in zones 5-7, Japanese anemones provide an excellent ground cover throughout the spring and summer, with the leaves turning shades of red and burgundy in fall. The plants are quick to establish—what began as five pots of Japanese anemones three years ago now is a lush border. Along with the lovely blooms and foliage, the plants are relatively trouble free—although Japanese beetles do consider the plants a delicacy. The plants prefer well drained, moist, humus-rich soil and will quickly spread with proper soil conditions. They tolerate some morning sun, but they don't appreciate water-logged soil—it's a quick way to kill your anemones. The plants rarely require division, and transplanting should occur in the spring. Still, you may find new sprouts in the old location after transplanting, as Japanese anemones regenerate from any bit of roots remaining in the soil. In colder zones, protect Japanese anemones with a layer of mulch in the winter, or plant close to buildings for shelter. In hot climates, avoid planting the anemones in areas that receive strong afternoon sun. Our anemones tolerate our shady garden well, stretching their blooms a bit toward the sun but producing a gorgeous, lush display of flowers in September and October. 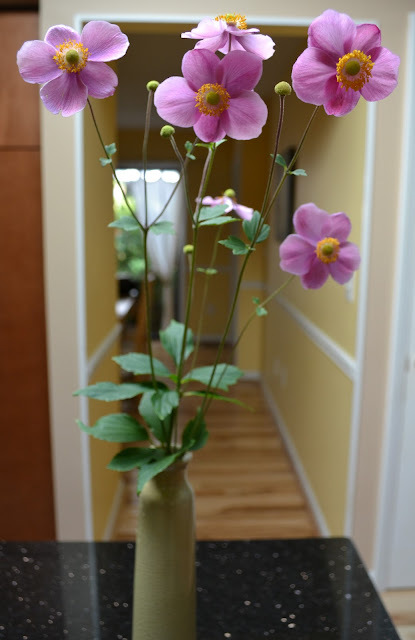 As part of my “31 Days of Garden Delights,” I snipped a few Japanese anemones, which are lovely cut flowers, for Floral Friday. There aren't many blooms remaining in the garden to create a Floral Friday bouquet, as I've done in the past. Instead, I'm enjoying the simplicity of a few perfect pink blooms to celebrate the beginning of the weekend.